Camping overnight on Wild Great Wall allows us to stay in the heart of the most breathtaking natural scenery, away from fast food outlets and rapid modernization, make us close to the history. The valuable experience of wild Great Wall camping is WAKING UP in front of the remarkable unbroken line of the wall right before the sunrise when the color is so serene and surrounding is so vivid. What is the camping equipment like? 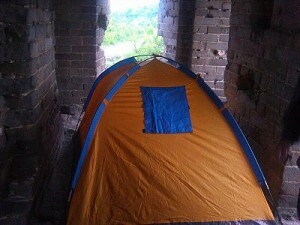 We provide you with all the necessary camping equipment to make Wild Great Wall camp as pleasurable as possible. Our tents are easy to erect. They are canvas square tents with 1 peg in each corner and a pole in the middle, complete with built-in floor and insect screens. We use spacious two-person tents and thick (air/foam-filled) sleeping pads, warm sleeping bags to ensure your evenings are comfortable and restful. All you need to bring is a sense of adventure to enjoy a comfortable night on the Wall. Can I have a single tent? Single tents are available on all our camping tours. 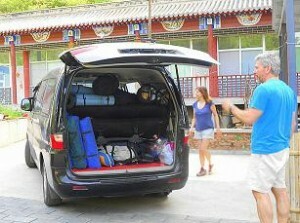 Sole use of tents can be requested at time of booking (limited number available) at 200RMB as extra charge.